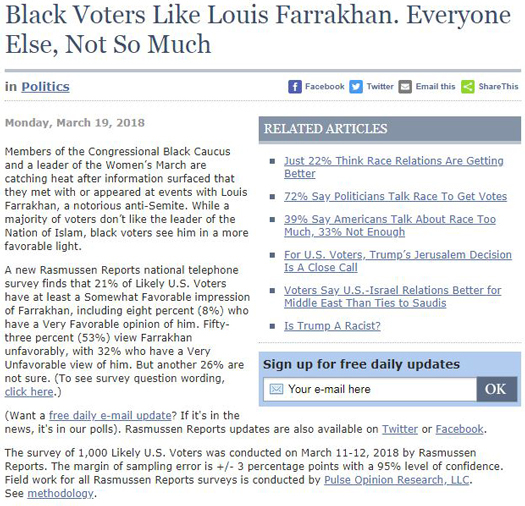 Contrary to the corporate controlled media driven narrative that Nation of Islam Minister Louis Farrakhan is not widely accepted, respected and admired by Black people, results of a recent Rasmussen poll countered that assertion. According to the poll, released March 19, while a majority of voters don’t like Min. Farrakhan, that does not include Black voters. The Rasmusssen report conducted a national telephone survey which said among other findings that 21 percent of likely U.S. voters had at least a “somewhat favorable” impression of the Minister, including eight percent that had a “very favorable” opinion of him. But among Black voters, half had a favorable opinion of the soon to be 85-year-old Muslim leader. “Fifty percent (50%) of black voters have a favorable opinion of Farrakhan, while 42% view him unfavorably. Among white voters, 12% have a favorable impression of Farrakhan, while 57% have an unfavorable view of him. Thirty-one percent (31%) of white voters don’t know enough about him to offer an opinion,” Rasmussen noted. Min. Farrakhan is convener of the historic 1995 Million Man March which drew nearly two million Black men to Washington, D.C. He also convened subsequent gatherings at the Nation’s Capital which have drawn hundreds of thousands of people of diverse backgrounds, ethnicities, religions and political ideologies. Min. Farrakhan has reached a new generation of people through his strong social media presence which includes, Facebook, Twitter, Instagram and YouTube. His public appearances still garner throngs of people, including nearly 11,000 who filled the Chicago Wintrust Arena for the NOI’s annual Saviours’ Day Convention. His remarks at the event drew anger and condemnation from those who continue to label him anti-Semitic.